After all is Said and Done, it’s Still Jesus. 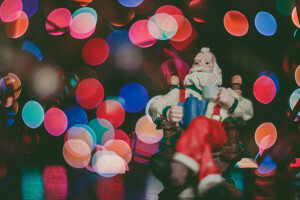 Christmas can be crazy and chaotic, but it is also a beautiful and meaningful time of year. I like listening to the classic carols, looking at lights and elaborate decorations, and I also love time together with family and friends. I remember making wish lists as a kid by going through the big Sears toy catalog and picking out what looked the most awesome to me. When gifts would be set out under the tree, I would shake the wrapped presents, furiously trying to determine what was in there for me. I didn’t always get what I wanted, even though I admit I got more than I really needed. Christmas can be so meaningful if you know that someone who loves you, is planning something special, specifically with you in mind. My parents did that for me while I was growing up. And now I get to do this for my own children. And I believe God is doing this for each of us everyday! I recently saw a popular bumper sticker. 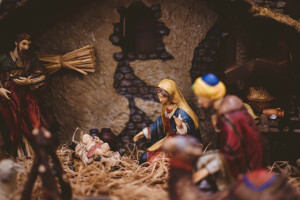 It said, Jesus is the reason for the season.Not too long ago, I received a Christmas card that showed a picture of a young boy with unwrapped gifts all around him – almost overwhelmed with all the presents. The caption on the inside of the card said, After all is said and done, it’s still Jesus.I am a Christian, that’s why I find Jesus at the very core of Christmas. God came to this Earth in such an incredibly humble way in the form of a baby born in a barn stall. The Christ-child is God’s amazing gift to you and me. That’s why Christians celebrate Christmas. God has prepared something great for each of us, and the way to that life is through Jesus! As you begin to see Jesus as God’s gift to you, than all the other things God has for you will be given. Several years ago, I took my family to the Smokey Mountains over the Christmas holidays. We rented a cabin and just hung out. One afternoon we went for a ride deep into the mountains. We listened to beautiful Christmas carols and looked at the quiet beauty around us. I will never forget that time. There was no tinsel and bright lights – just the simplicity of a family thinking about Jesus’ birth and enjoying God’s creation. My hope for all of us is that we will have those quiet moments this holiday season when we realize what is truly important. Jesus truly is the reason for the season.